To begin with, here’s the tank early on, as a reference point. Lots of nice plants started, and the first fish. So here’s the tank now. So, more fish…. and the plants are thriving. 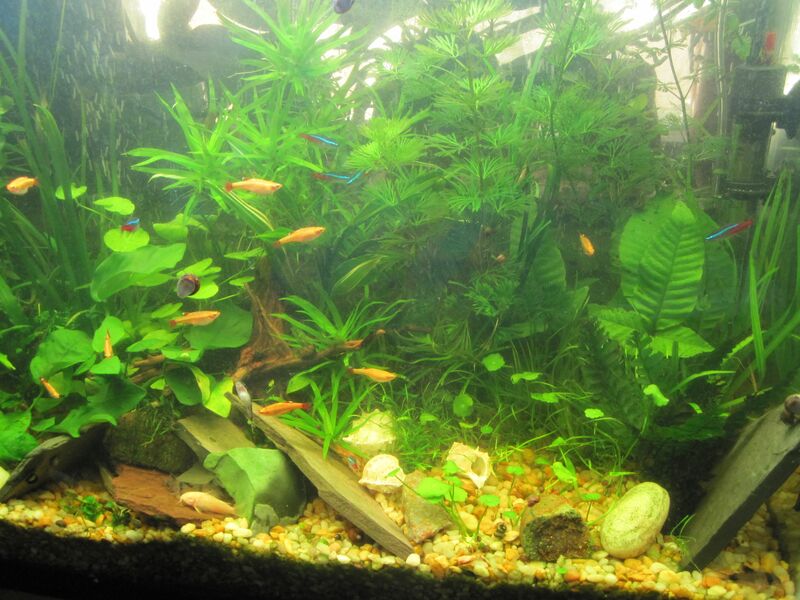 Basically the whole back of the tank is a jungle. These guys are doing well now too. In the middle is the Algae Eater, one of two. He used to be the same size as these guys. The guys hanging onto the glass are the Oci cats. Poor Algae eaters used to school with them, and it used to be just the hanging on the glass thing that set them apart, but now they are about twice as big. 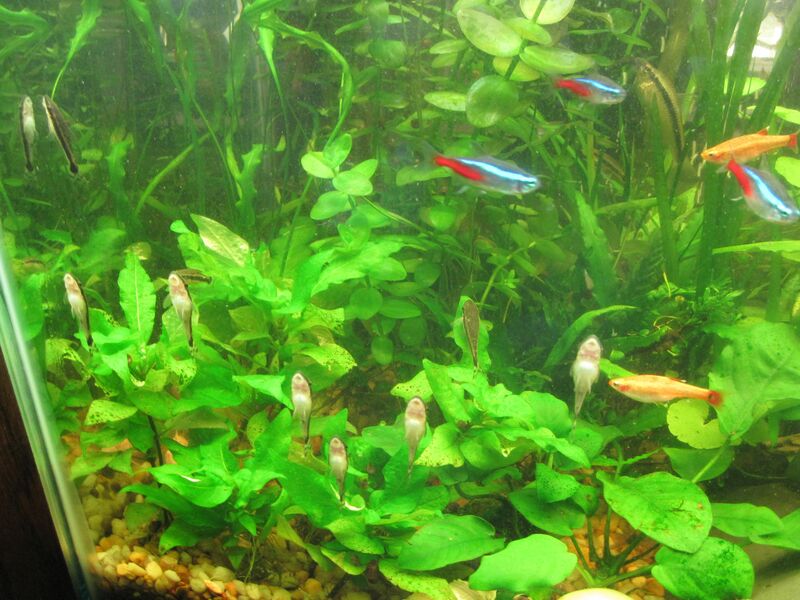 They mostly just lurk in the greenery, munching algae. And these guys also lurk back there – I only ever see them when I feed them. Hard to believe it, but you simply cannot see him when he’s back behind the plants. Weird. Someone else who is hard to see – and I can’t get a photo of him – is the BABY MINNOW. Lurker was over, and she saw him. He’s still mostly just pale, but I think he’s another of the golden fish. And I think he’s big enough to be past the eat-on-sight stage, so he’s probably safe from the big guys. Instead of being like 1/4 inch long, and looking like a pair of eyes, he’s more than 1/2 inch, and really looks like a little fish. For all I know, there could be dozens of them back there. EEK! EDIT: It’s not a baby minnow. It’s a baby albino catfish! I keep getting distracted, and time slips by. The fish tank is chugging along now. There was a terrible pea soup algae situation which I finally resolved with a very fancy new filter/uv light gadget. Basically all the water passes though a tube with a uv light, and it zaps the single-celled beastie’s dna, and voila, no green water. Apparently it also kills of a wide range of fish pathogens, so it is full of win, but does mean I’m stuck with a filter. 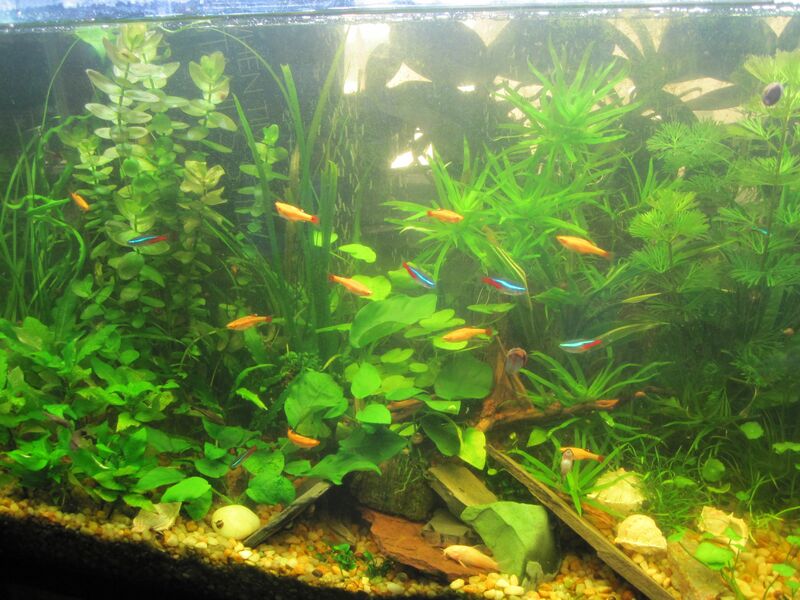 The water quality is consistently great although the tank is densely populated, so the plants are definitely doing a great job. 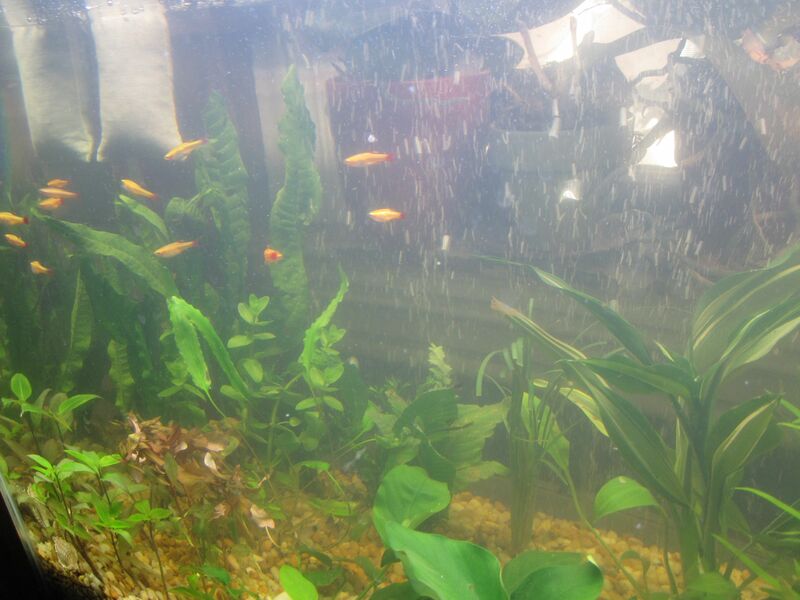 And, surprisingly, all the plants and fishes and snails and shrimp survived the algae overload. …wait, the shrimp? Yes, I have five Ghost Shrimp. They are really weird, and I’m not sure I like them. I have to work very hard not to think cockroaches when I watch them. But if I can avoid the eek-an-insect reaction, they are different from the fishes, and cool to watch. Mostly they hide under one of the rocks, but sometimes I’ll see them ghosting delicately about in the plants. Still no fry from the Golden Minnows. Maybe they have attempted something I missed. 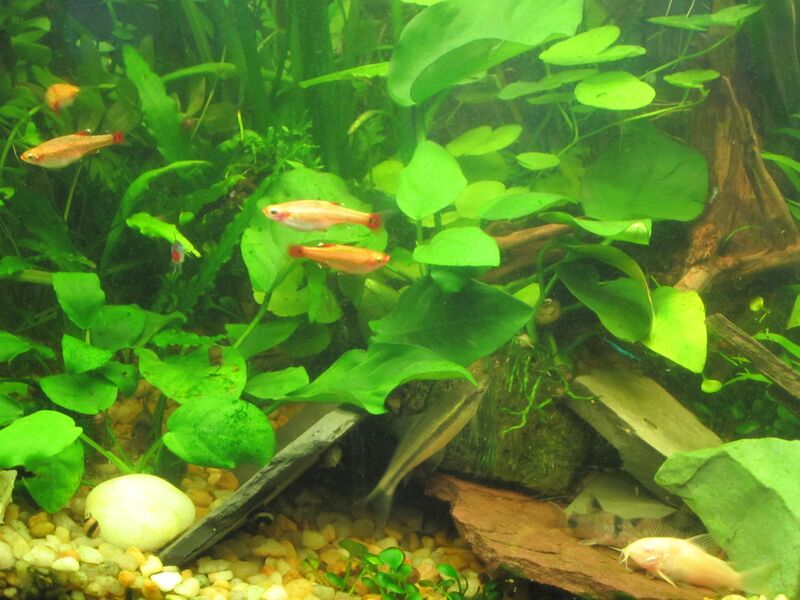 I think, though, that the Neon Tetras are likely to scarf up any baby fishes that appear, so if I wasn’t right on top of a hatching I doubt I’d see the fry. After all, it took me weeks to finally see the shrimp. I put them in the tank and they vanished. There is a forest of greenery in there at this point and anything could be in there. 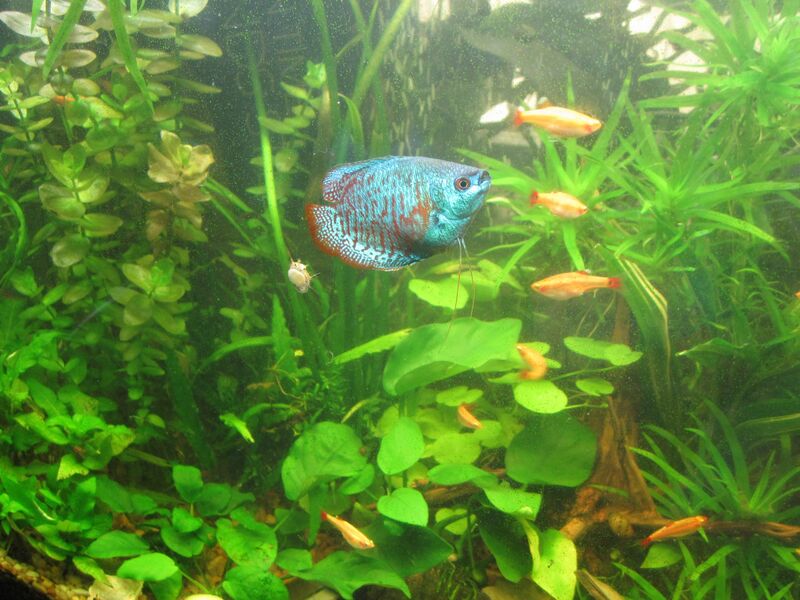 Heck, for a day or two I was wondering whether I’d somehow lost the two-inch disc-shaped gouramis, but it turns out they are just really well camouflaged by the weeds. I also have lots and lots of snails, and I need them. Keeping all the plants going has a side effect of encouraging algae growth on many surfaces. This isn’t the stuff that floats in the water, so the filter doesn’t effect it. Most of them are Nerite snails. They are largish – about 3/4 of an inch in diameter – and colorful, and best of all, they won’t reproduce in fresh water. So total win. Some are brown and red and reminiscent of pottery, and some are yellow and black like little bumble bees. I also have some ramshead snails that, unfortunately, do reproduce. But since I think they are the ones doing the lion’s share of the algae cleaning, I don’t regret them. But I do fish out the ones I see on a constant basis. Even so, they reproduce so skillfully, and there are so many hiding places for them, that all I am doing with this is preventing truly exponential population growth. I doubt I could eliminate them all, no matter how many I remove, especially since anything I’d introduce to get rid of them would do in my Nerite snails as well. But mostly I am liking to see them all, Nerites and ramsheads, busily at work polishing the tank walls and plants, so that’s okay. The corys are thriving. They hang about in little packs, rooting among the gravel and plants. They have lots of sheltered areas under rocks and driftwood and plants, and they sit there in piles. They are also given to swimming around in groups of five to nine or so. It looks fun. The pandas are my favorites, being smaller and more enthusiastic somehow. I also have some albinos. They are larger, and given to uprooting plants. They also seem somehow morose. Pretty, though, against all the green. And there are a dozen ocis as well, vacuuming up algae like mad, and hanging about by their mouths. They have little round stomachs from all the algae, and seem content. They are also given to randomly resting upside down, which is oddly endearing. A bit goofy. So it is all very busy in there, and – knock on wood – nothing seems about to crash. I was looking at the Golden White Cloud Minnows, and some of them were looking lumpy. I was worried, so I looked up fish diseases, vaguely remembering fish can get something called dropsy where they swell up. But it isn’t, and they all look perfectly healthy, just lumpy around the stomach. So they are just full of eggs. Way more than half of them. It’s hard to tell because they school so skillfully that I can’t get a count. Or even be sure of their gender – the egg-packed ones are females, but are the others males, or just immature females? Are there any males? Well, it would simplify things a bit if they were all females, but it seems a bit much to hope for. I thought that I’d checked it out and the minnows were not all that easy to breed before I bought them. There was a lot about raising temperatures and then dropping them to imitate seasons. Soft water. Lots of details. It should have been really difficult to get it all started. I don’t want a population explosion. But here we are, a whole little band of egg-packing minnows. Apparently when they finally get around to it, they will spawn on top of some plants. At that point, probably the snails or the other fish will nom on the eggs and hatchlings, I hope efficiently. At least, so far I’m not seeing courting behavior among the non-swollen-with-eggs fish. The boys are supposed to start displaying to each other, and showing off. In fact, all I see is the lumpy females playing chase with each other. Who knows what’s going on. Maybe I have a lesbian minnow commune here. Who knows? I wouldn’t live in ANY of the new Berkeley construction, not for free, not if they paid me. Questions have also been raised about whether the deck, which measures about 4.5 feet by 8.9 feet (4’-5¾” x 8’-10¾”), was overcrowded and that, perhaps, the weight of the young people on it contributed to its collapse.The deck was constructed to 1988 code standards, which required it to hold 60 pounds per square foot, according to Chakko. That meant the balcony should have been able to support at least 2,391 pounds, which is more than the 13 students standing on it would have weighed, assuming an average weight of 150 pounds (total of 1,950 pounds). “Segue Construction, the Library Gardens general contractor, was involved in two San Francisco Bay Area lawsuits in recent years involving allegations of dry rot and substandard balconies at condo and apartment projects in Millbrae and San Jose. Among other things, Segue was accused of improperly waterproofing balconies. Both cases were settled in 2013 with Segue, developers and other parties agreeing to pay millions of dollars. Robin King on So photos!